I worked at the advertising agency Ackerman McQueen back in 2002. We had an excellent team and did some interesting work, however due to strange circumstances they let the team go. Well, here it is 8 years later and I find myself back at AM. They are extremely busy and have some interesting cutting edge projects going on. We are currently doing .NET/Umbraco CMS/XSLT development for a large national client. The Degrafa graphics framework for Flex is very slick. I have been using it on my flex real-time monitoring applications. Here is a configurable meter that I created using Degrafa. Feel free to use it if you find it useful. Got a new High Def camcorder for helmetcam footage (Aiptek Action HD). SD card video cams are getting so small and light now! I just mounted the camcorder directly to my helmet. Didn’t even use a special helmet cam set up. Quality is much better and set up is easier. No more wires and batteries to contend with. TORO Prerace Recon – Bowie, TX 10/26/08 from scott chidester on Vimeo. 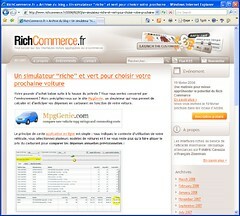 MpgGenie.com was featured on the RichCommerce.fr site. I wish I could read French to find out what they said about the site! Made some updates to MpgGenie.com. 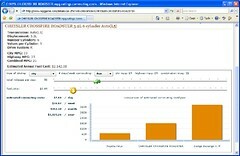 The individual vehicle flex application now shows a bar chart to compare yearly commuting costs.